A few weeks ago I was at Ulta picking up a few of my Pureology hair product staples and much to my surprised delight there was a free gift with purchase!! 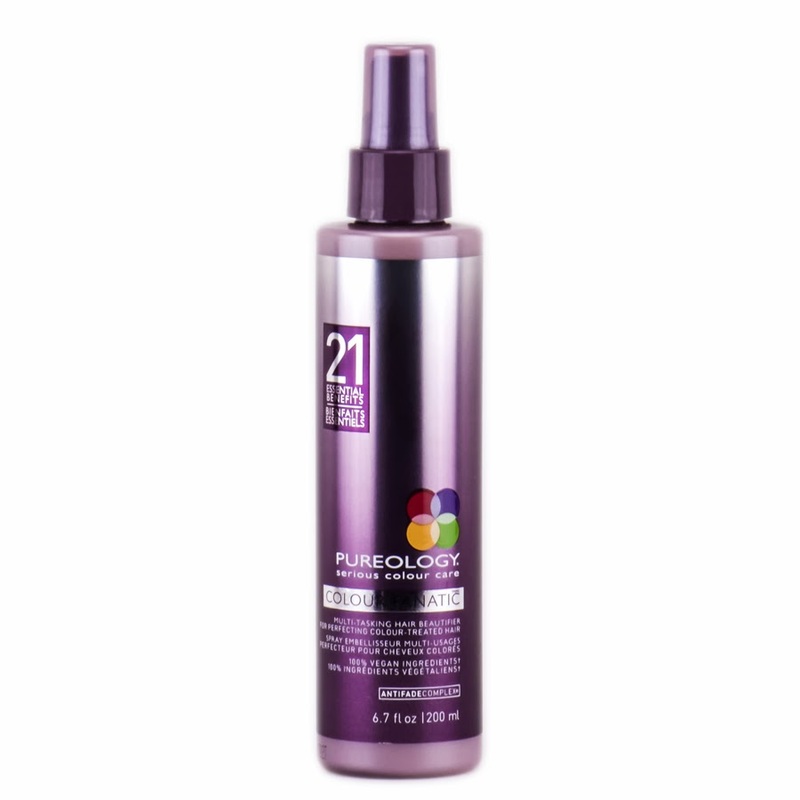 I received a mini 1 fl oz sample of the Pureology Color Fanatic 21 Benefits Hair Treatment Spray and was very excited to try. I opened it up and sniffed it right away, and it smelled quite lovely. Very calming and soothing. I have had success with Pureology's sprays in the past. I currently was mixing the Perfect 4 Platinum Miracle Filler (if you are blonde- BUY THIS. it is amazing) and Essential Repair Color Max Spray. So I hopped onto Pureology's website to learn about this new spray which supposedly does 21 things at the same time. Wow- that is a lot of live up to. That is a whole lot for one little spray isn't it? So for a few washings I used the spray just on it's own to get a feel for what it really does, applying it to freshly washed and conditioned hair prior to my other stylers. Every time I used it I had the same results: less frizz, softness, great shine and the most impressive attribute- my hair is air drying faster!!! I don't know how that is possible, but it seriously slashes time off my drying time! I also diffused it one day and it took less time to diffuse too. That alone is incredible and worth the price of admission. So after I got the feel for the product I now have it mixed with my Perfect 4 Platinum and Essential Repair Sprays. Once I run out of them I plan on using just a mix of Perfect 4 Platinum and Color Fanatic alone. Yes, this little gift with purchase impressed me so much I will be buying the full size! Good job Ulta & Pureology Marketing!! I am a big beauty tool and gadget junkie! I get so geeky and excited over this kind of stuff so I figured I would do a video talking about my favorite tools and also one that was a huge disappointment to me. So this is a first impressions post, as a full review of this product along with another product from the same line will be coming to YouTube & my blog soon. 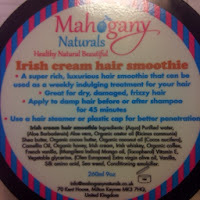 But yesterday I tried out the Irish Cream Hair Smoothie by Mahogany Naturals for the first time. 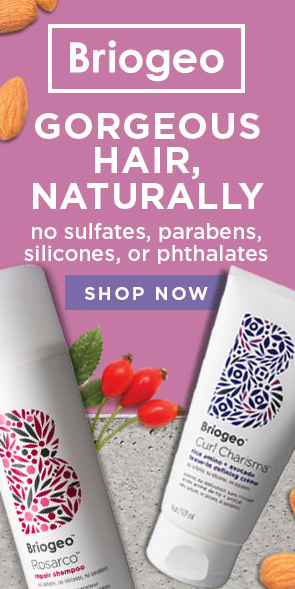 This is a UK based hair care brand and I love that the products focus on all natural ingredients! The label says it is super rich and luxurious and great for dry damaged and frizzy hair. Since my hair is all of the above I couldn't wait to play with it!! The label also said to use a hair steamer or plastic cap for better penetration. 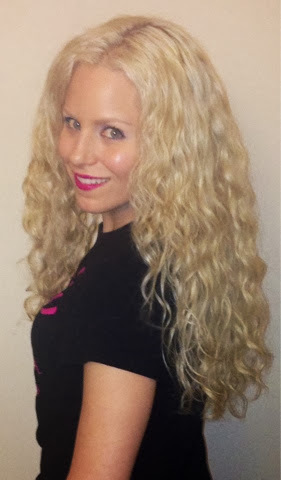 I applied the product on freshly shampooed, wet hair section by section and then sat under my huetiful hair steamer for 2 steam sessions (40 minutes) Then I applied Clairol Shimmer Lights Conditioner on top for 5 minutes (to fight the brassiness in my blonde hair) Rinsed it all out and styled as usually lately. Lately actually I have been finger combing my wet hair more than usual to elongate my curls so my hair looks a little longer. The products I used to style were the Pureology 21/perfect 4 platinum spray mixed, SheaMoisture Smooth & Repair Conditioner (as a leave in), Living Proof Prime, Resore Cream, Devacurl B'leave in, Archangel and sealed with pure Argan Oil. I allowed my hair to air dry and the pictures here are day 1 from last night when it finally all dried! I noticed after I rinsed this smoothie out my hair was SUPER soft and also have nice shine. I also noticed I have some good curl formations going on. With this dry winter air my curls have been hiding at times. This smoothie is SUPER rich and concentrated. It is very thick but my hair absorbed it nicely. I love some of the unique ingredients in here including whiskey (!!) and coffee. It also contains a bunch of delicious butters and oils. Smell is okay- it smells like a weird version of vanilla to me. I am excited to use it again next week and see if I can duplicate these results! disclaimer: this product was provided to me from the company for review consideration. i do not receive any monetary compensation, nor am I enrosed for my reviews. Everything stated is my own and honest opinion. Man I am so behind on blogging! I hope you are following my Youtube, I stay much more up to date over on there. Anyway, the beginning of February Tarte Cosmetics has an AWESOME Today's Special Value kit on QVC: Color Your World with Shades of Clay featuring new products infused with their new star ingredient, colored clay! Colored clay is full of minerals and helps hide and correct a multitude of skin sins including, redness, dullness, and uneven skin tone among others. The good news is, even if you missed the TSV price, it is still available on QVC.com (at time of blogging) for only a few dollars more!! And finally, I took all the products together and did a nice full face demo with them! blush, bronzer and even eyeshadows in one!! Be sure to check the video review for details to a quick synopsis is overall I really do LOVE this kit! The stand outs for me are the blush bronze and the liquid foundation. The blush/bronzer is gorgeous for not just bronzer and blush, but if you dip into the shades individually you can even use them as eyeshadows! The liquid foundation is a new Holy Grail. I can't believe tarte made a foundation I like even more than the original Amazonian clay- but it is super pigmented, buildable coverage and you don't even feel it on the skin! 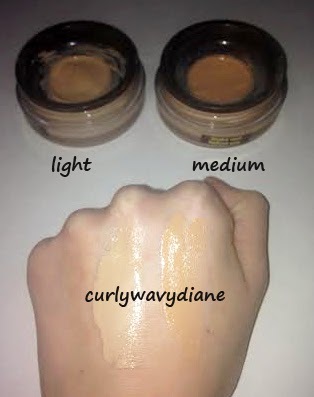 Because my skin tone is constantly changing I got the kit in both light and medium (oh how I wish light-medium was offered) Here are the 2 shades swatched side by side with and without flash. I also notice since using the colored clay products on my face daily, when I wash my face at night, my bare skin is starting to look better! The only thing different in my routine has been the colored clay products! disclaimer: one kit was sent to me, one kit i bought with my own money. i am not endorsed or sponsored by any company and receive no monetary compensation for my reviews. all opinions are my own honest opinions, as always! 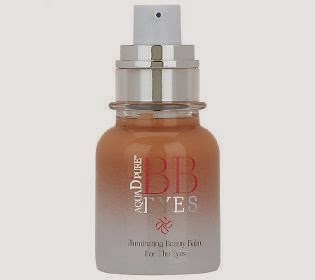 The Aqua D'Pure BB Eye Brightening Cream by Dalton Cosmetics intrigued me from the first time I saw it presented on QVC. I am starting to get older (as is everyone, really) and my eyes are slowly showing the first signs of aging- fine lines, puffiness and the uber deep dark circles I have genetically had forever. So any product be it cosmetics, skincare or a hybrid of both like this little gem to help these issues always catches my interest. Here is what the QVC site has to say about the product: "Prep, prime, and help soothe. This lightweight, water-based formula uses ingredients like rhodiola extract, amino acids, peptides, and antioxidant vitamin E to help correct the appearance of fine lines, dark circles, and the visible signs of skin dryness around the delicate eye area. The result is a smoother, more radiant look. From Dalton." Of course you can go and read that on their site. I'd like to guess you are reading my blog (p.s. THANK YOU!) because you wonder what I think?? I really like this product! First here is what is doesn't do: it does not fully conceal by itself, nor is it supposed to. 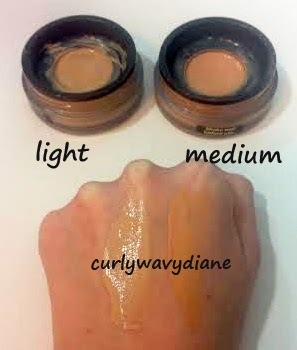 It is not a full coverage concealer but a cream you apply under your concealer to do a few things. 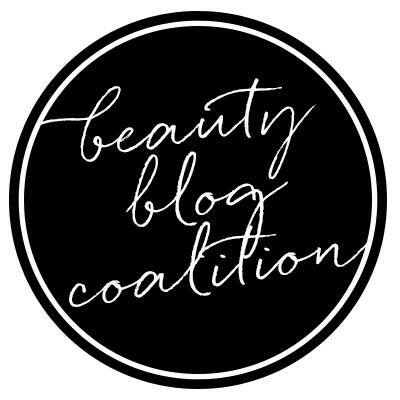 These things include make your concealer last longer, help prevent concealer and makeup from caking into fine lines, help the eye area appear brighter and also help fight the signs of aging over time. Now while I can't exactly attest to the last attribute yet, since I have only been using this product a month everything else I find it does beautifully. This winter has been so cold my eye area has been extra dry to where even my favorite concealers started to settle in my lines. When I wear this BB cream under them, they do not! This also can double as an eyeshadow primer helping eyeshadow stay put all day but for whatever reason I like using my regular eyeshadow primer on top of this- it isn't a waste as my eyelids are getting the anti-aging effects of the cream. disclaimer: this product was purchased with my own money. i am not endorsed or sponsored by any company. Here are my unboxings/unbagging for the the February 2014 Ipsy & Birchbox! My Ipsy bag this month was INCREDIBLE!!! You guys I am so sorry. I really need to get in the habit of syncing up my blog with my Youtube uploads better! Here are my last 3 empties videos: Products I used up with hair care, skincare and makeup plus mini reviews and if I would repurchase them or not. Hope you like! 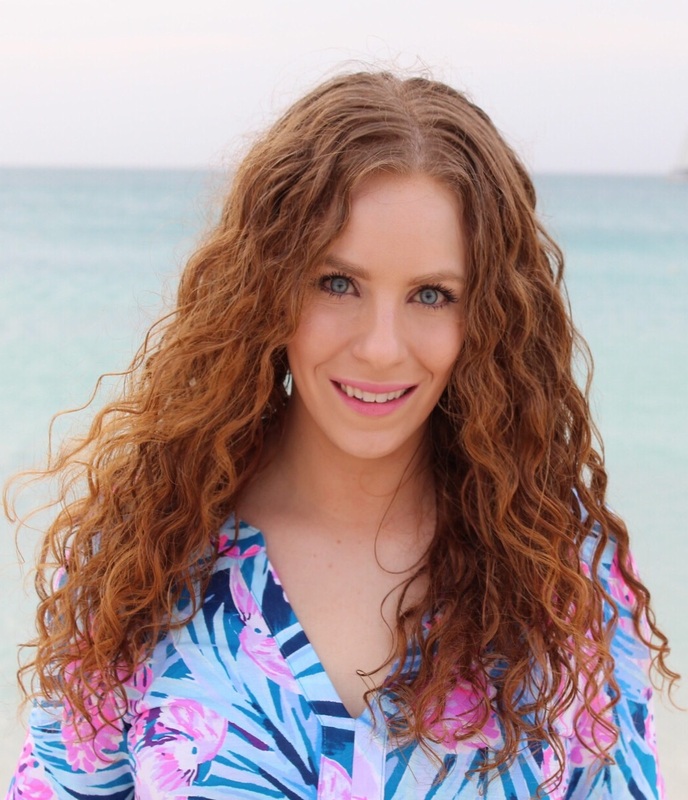 Check out this video I recently did providing all the tips and tricks I could think of to help me grow my curly wavy hair! I have been growing out my hair for over 2 years now and have tried and experimented with a lot of different things to get it to grow as quick as possible. I also want to be proof that you can have long, color treated hair as long as you treat your hair properly and give it the TLC it so badly needs! I hope you found this video helpful! Remember I am not a professional hairdresser, just a regular girl and these are things I found working for ME- but everyone is different. Tarte Cosmetics Cheek Stains Review & Swatches! So in a complete blonde moment, I totally thought I did this blog already but I did not- so sorry! I had the video up on Youtube a few weeks ago. 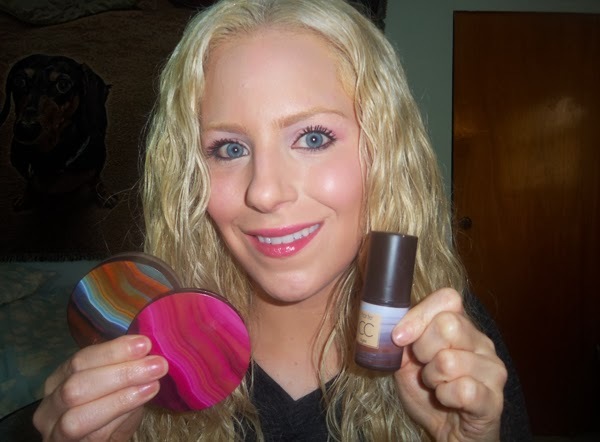 Tarte Cosmetics recently relaunched their ever popular cheek stains for the Spring 2014 collection! The cheek stain was the very first product Maureen Kelly (founder & CEO of tarte) created in her New York City apartment in I think it was 1999. The cheek stains are now housed in a smaller, eco friendly container with beautiful labels that I am absolutely obsessed with! (seriously- i want the "flush" shades wrapper as a wall paper!) The stains come in two formulas: gel or cream depending on the tops and they are very natural looking and wear all day. I also like wearing them on my lips too! A little goes a long way with these and you can build up the intensity to your desire. What is also great about them is they have a super fruit complex™ of five most active antioxidant-rich superfruits (maracuja, goji, açaí, acerola, and pomegranate) that benefits your skin with wear! In all honesty, as much as I LOVE tarte, I wasn't too familar with these until now and man was I missing out! These are great- multi tasking cheek and lip colors that stay put all day and are good for my skin. What's not to like? disclaimer: these were provided to me by the company. i am under no obligation to review and all thoughts, opinions and statements are my own and honest, as always. i am not endorsed or sponosred by any company nor do I receive monetary compensation for my reviews. So 2 days ago I went to get my roots touched up. As usual I waited too long to get them done and they were pretty bad. Of course once I got them done now my hair looks all great and super blonde again. I tell myself I won't go 7 weeks until the next appointment LOL. We will see what happens. While at the salon, my hair dresser, Lisa, kindly agreed with me when I said I was way overdue for a trim. I had my roots touched up in December but truthfully I have not had a trim since the beginning of October 2013. 4 months! I try to stretch my trims out as long as I possibly can since I am growing my hair long. I should have taken proper before and after photos, apologies that I did not. But you can see some pics I took once home with my touched up roots, and trim. The other thing I love about Lisa & the salon I go to is it is a salon that caters to curly girls like myself so they give me a "scrunch set" and diffuse me properly. In the past I would always just leave salons with my hair wet since whoever colored my hair had no clue what to do with my wavy curls. These pics are actually of day 2 hair. Day 1 at the salon after the color they did a glaze and deep treatment and styled with DevaCurl One Condition (left In), B'leave In, ArchAngel Gel & Styling Cream. 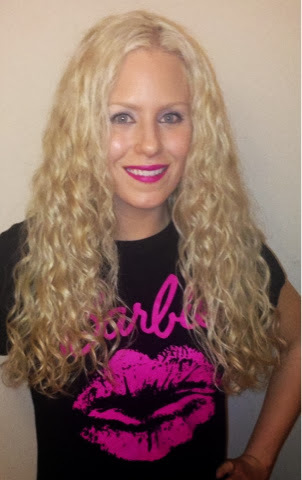 On day 2 I refreshed my hair section by section with Pureology Perfect 4 Platinum Miracle Filler & Color Max Spray mixed and then put some CURLS Cashmere Jelly on top. My hair feels nice and healthy and fresh again. 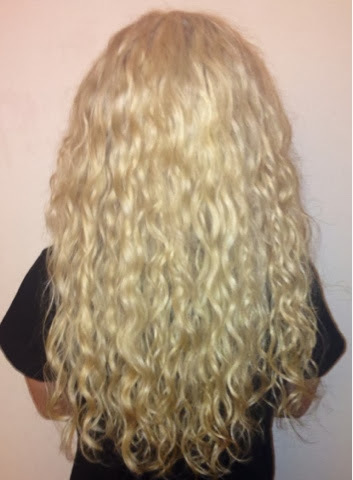 The one sad part (well sad to me) is no matter how little of a trim I get, because it helps to oxygenate my hair my curly waves always become bouncier and shrink up a bit. Good for curl defintion but man it plays mind tricks on a girl who is growing her hair and wants length, length, length! I bet a bunch of you can relate?? Make sure you check out this blog post where I talk about my last trim and also list signs your hair may be due for a trim. 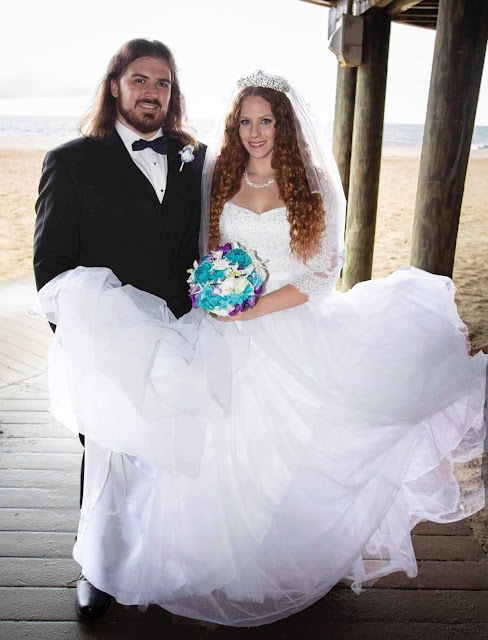 And if you are in the New York/New Jersey area you should totally check out Marucci Hair Design in Staten Island. The whole team there are super sweet and super talented! Every time I go to that salon I feel more like I am going to hang out with friends with a bonus of my hair looking better when I leave. I just can't suggest them enough! And if you go, tell them Diane with the long blonde curls sent you! !